Cool, nice to hear 🙂 Thank you for sharing your thoughts! Yes 🙂 Nice to hear you are into cars… I was watching Formula1 races with my brother as well when I was younger 🙂 Great to hear your thoughts, thank you for sharing! Haha yes 🙂 Thank you Joe! I was mad about toy cars too. Is there a gene for that? Interestingly, I really haven’t cared about cars all my adult life. I no longer own one, or drive, if I can help it. Thank you Aldous! Yeah I am wondering about that gene 🙂 My son clearly didn’t get it from his parents. But maybe he will have enough of cars at some point like you. Thank you for sharing your thoughts, very interesting to hear! Cool to hear 🙂 My daughter also plays with cars but I think it is mostly because she wants to do what her older brother does. She doesn’t show such passion as my son 🙂 Or maybe they are both very androgynous because my son is sometimes into “girly” stuff also. Or maybe just at their age it doesn’t all matter. Thank you for sharing your thoughts Jackie, it is very interesting to hear! I like the way the others are out of focus in the background, makes the ones in front stand out more! Cool to hear about your experience Suzy. Sounds like your brother was taking very good care of his cars 🙂 It’s great you recognised the Mystery Machine! And yes, it seems it is “ageless” and still considered very cool. Thank you for sharing your thoughts and for your kind words Suzy! our girls does the same with their lego. Great to hear 🙂 With lego you can get really creative. Thank you so much for visiting and sharing your thoughts! Thank you so much Diana for your kind words! And thank you for the link to your blog post. I see cars mean a great deal in your house also 🙂 I’m happy about your visit here, you are more than welcome again any time! 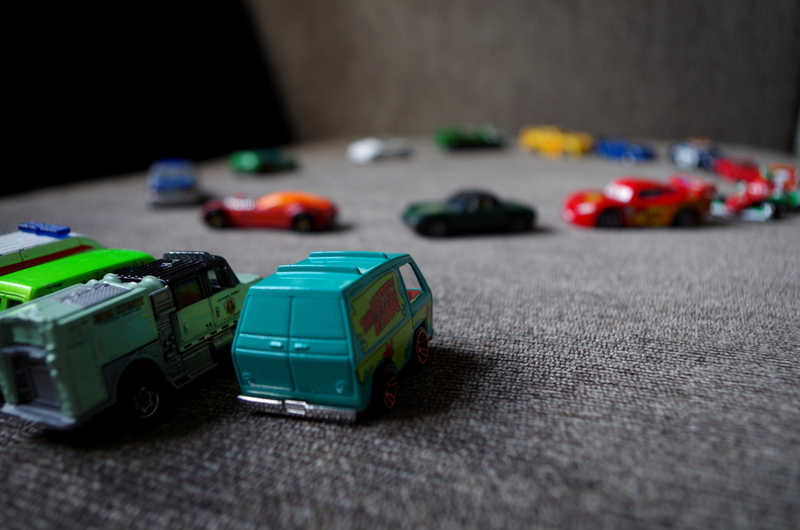 Ohh,the mystery machine reminds me of my childhood.I loved Scooby-Doo…I still do! Cool 🙂 Thank you for sharing your thoughts, it is much appreciated! These little fellows are becoming an ocean throughout our home. My son, how shall I say…? Is quite obsessed with them. Love this shot. It captures so well that they’re being played with, even though there’s not a kid in the picture. Thank you so much Warren! They truly are played with, in our home and I’ve seen in other places also 🙂 I’m happy about your visit here, and really appreciate your follow! I hope you will enjoy some more photos to come. He got a nice collection.